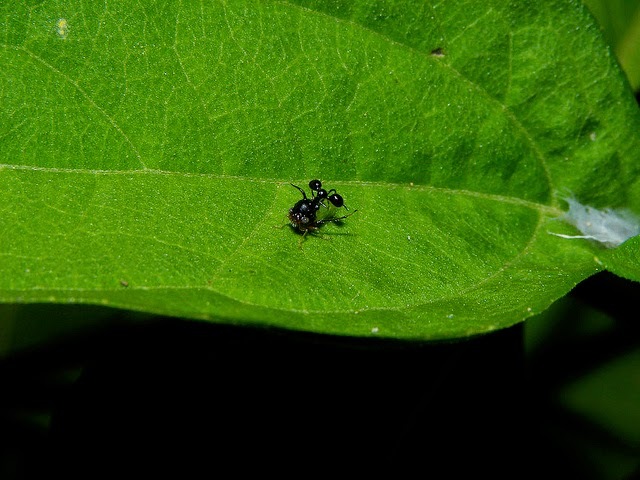 Take a look at the picture of an ant, above. Yet, this is not a photograph of an ant: it isn’t even a photograph of an ant attacking an insect. 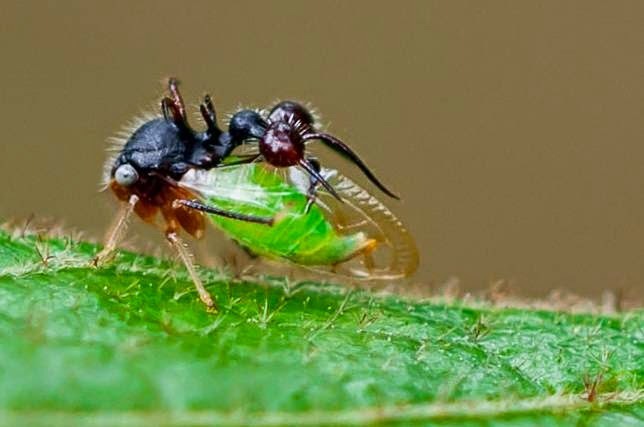 It is in fact the ant-mimicking treehopper (Cyphonia clavata) which keeps itself safe from predators by pretending to be an ant. What looks like an ant here is actually extension growths on its body - which most other insect species are incapable of creating. The plan is that any predator looking down will only see what looks like an ant. The rest of the treehopper’s body will blend in with the foliage. 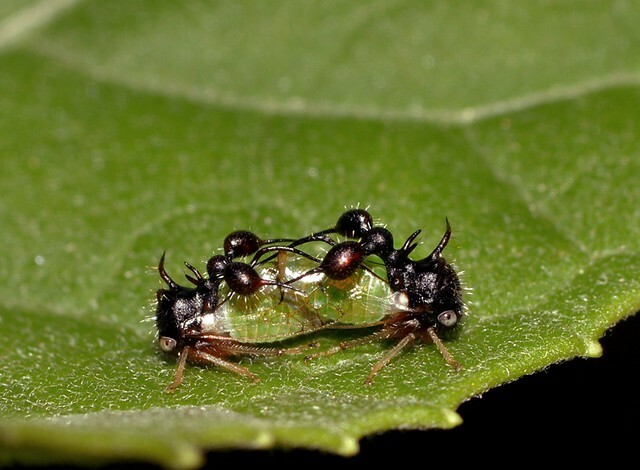 What seems, at first, strange is that the body of the ant is positioned backwards on that of the treehopper. 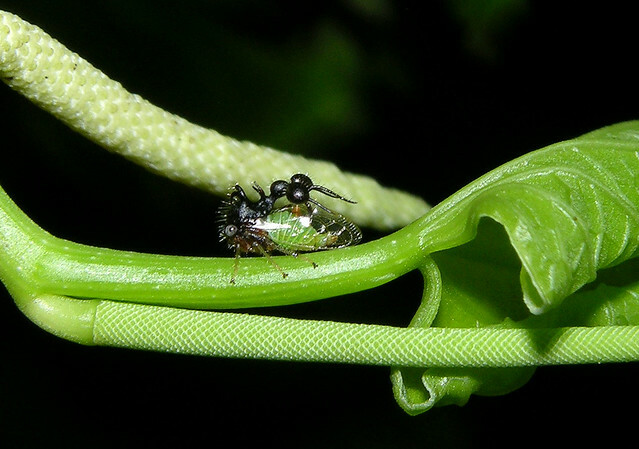 Take a look at the abdomen of the ant and you will see the tiny green eyes of the treehopper. Why is this? It is because when it is in defensive mode an ant will move backwards. In this way, the ant-mimicking treehopper (which can be found in in Middle and South America) has, in fact, got this right too. This particular species is not alone in its mimicry of the ant. All told there are over 2,000 species of insects and spiders that imitate an ant in one form or another. Not all of them go to this extreme, however - and for good reason. Scientists have recently discovered that this is a body plan innovation rather than a modification of an existing part of the insect’s anatomy. This is incredibly rare in evolution. It would be akin to us producing a third type of appendage in addition to our arms and legs. Although it is not known what constrains other insect species from adding new features, the fact is that generally these restrictions are in place. 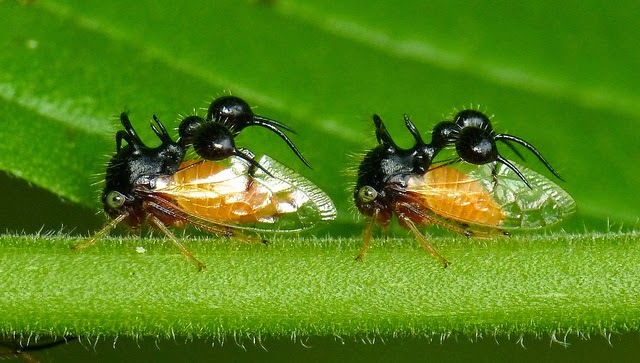 These wing-like structures appearing from the helmet (also called the pronotum) of the ant-mimicking treehopper makes it, then, all the more unusual. 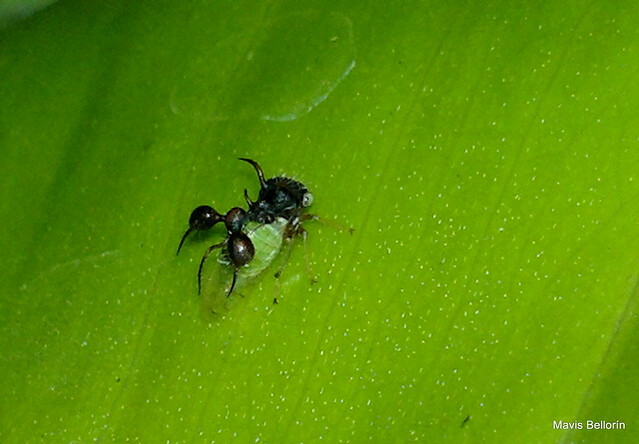 The helmet is formed on the thoracic segment of the insect, known as T1 – the first segment where wing formation should be suppressed if the treehopper were like most other insects. Legs extend from each of the thoracic segments – T1 – T3 but wings will typically only be formed on T2 and T3. 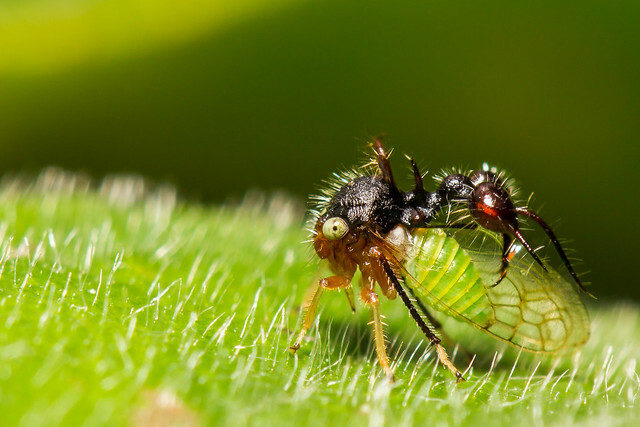 Biologists now believe that factors involved in wing development are expressed in the T1 section of the treehopper as well as the second and third sections. In other words the genes which inhibit the development of wings in the first thoracic section have, in fact, been suppressed themselves. So, the helmet of the treehopper species arose by it somehow eluding the limitations of the genes which ordain and fashion the number and pattern of additions along the body of the insect. 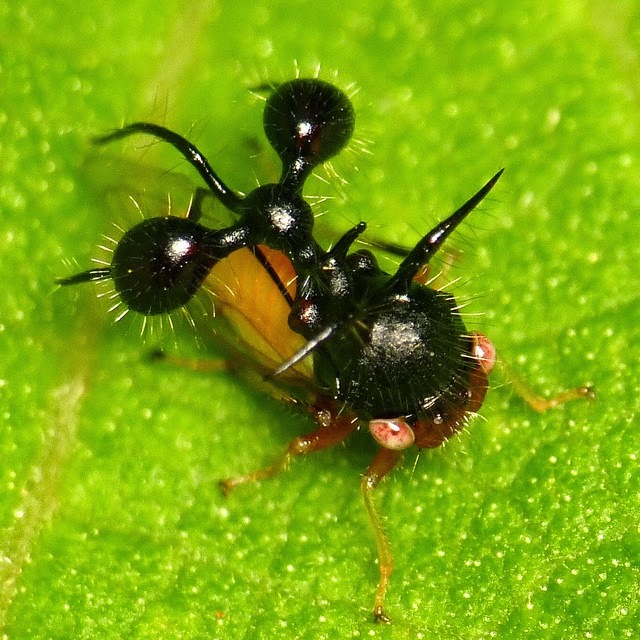 The helmet of the ant-mimicking treehopper is not a wing but wing-like. As such scientists now think that as it did not need to follow the strict functional necessities which the need to fly imposes, the helmet was able to develop, generation by generation, until it reached its optimum similarity to an ant. 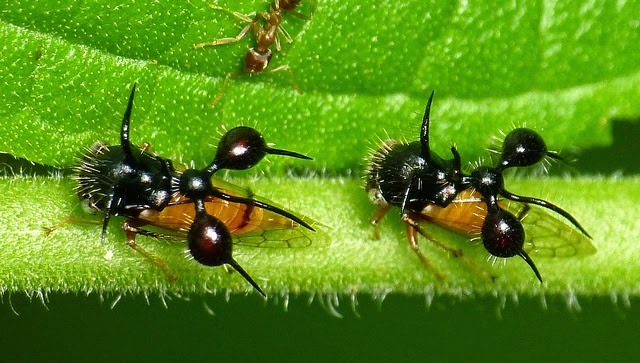 Quite how it transpired that the treehopper was able to mimic the ant so closely is still not known. Yet the fact that we do not how does not preclude the jaw becoming slack at the evidence that it can.